This is a video from Youtube channel Warped Perception (previously) featuring some up close and personal footage of yellowjacket wasps shot in ultra high definition. Admittedly, up close yellowjackets actually look kinda cute, and, just like an ex before they're an ex, that they weren't only put here on earth just to ruin your life. Keep going for the video, there's actually some learning to be done if you're interested. Thanks to Hartley, who agrees Members Only jackets are still cooler. Bees are amazing. Wasps and hornets can all get fucked. Really fascinating. Those mouths are a Cthulhuian nightmare. I like how they use 'cute' music to try and make people less inclined to smash it while screaming loudly. Didn't work. They look great mounted on the wall though. 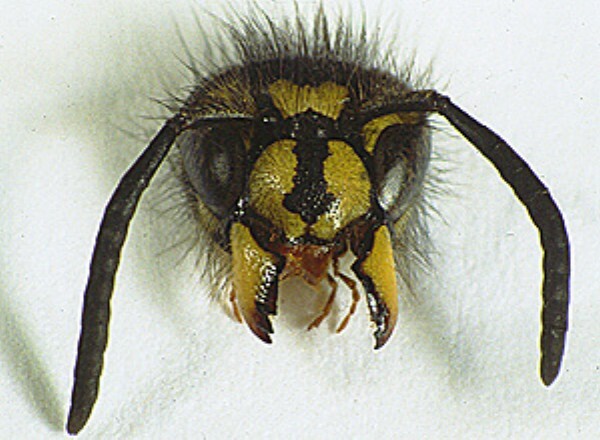 Vespula sp., bane of the backyard BBQ. The "kill it with fire" was the first thing that crossed my mind.